The officials of Lagos Police Command in conjunction with other agencies today arrested 133 badoo suspects in different parts of Ikorodu, Lagos. It was gathered that the joint operation led by the Deputy Commissioner of Police (DCP) in charge of Operations, Imohimi Edgal, stormed Ikorodu in the early hours of Wednesday following fresh intelligence. We gathered that most of the suspects were raided at Majidun, an area hitherto occupied by militants. 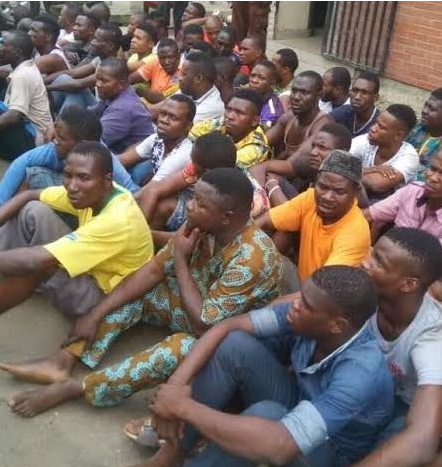 They were arrested during raids at Bayekun, Ikorodu Main Town, Igbogbo and Majidun by the police, Department of State Services (DSS), Rapid Response Squad (RRS), Lagos State Neighbourhood Watch Corps (LNSC), Oodua People’s Congress (OPC) and local vigilante group, Onyabo. Today’s was the fourth since the security forces began clampdown on suspected cultists, ritual killers and kidnappers terrorizing Ikorodu. There doesn’t seem to be light at the end of the tunnel for Nigeria. See the future of our nation (youths), engaging in the most heinous, egregious, barbaric acts such as ritual killings, kidnapping, murder etc. Yet, there are numerous churches and mosques on almost every street in Nigeria. Who are we fooling? – God? I just pity that nation as the future appears very bleak. The youth have no ambition as to nation-building or contribute positively to the development of our country, but more engrossed with evil, get rich quick schemes. What a waste. One thing that i believe is that life is a choice, is not every Nigerian youth is engross with evil minded, but as a person you think and ask yourself what do i want in life. LOLA O you statement is a positive one. Most of them will be innocent, hooligans will innocent….. Make God help us. what about the politicians and others that these boys are working for? Unless they are exposed and arrested, this evil menace called Badoo cult will continue. They are the ones that lure these boys to join the cult and took advantage of them due to ttheir poverty background. We have been told that some of these boys have confessed to being sent by certain people in the society. This people they raided was not a Baddo members…They just keep raiding innocent people calling and tagging them Baddo. Make una fear God!